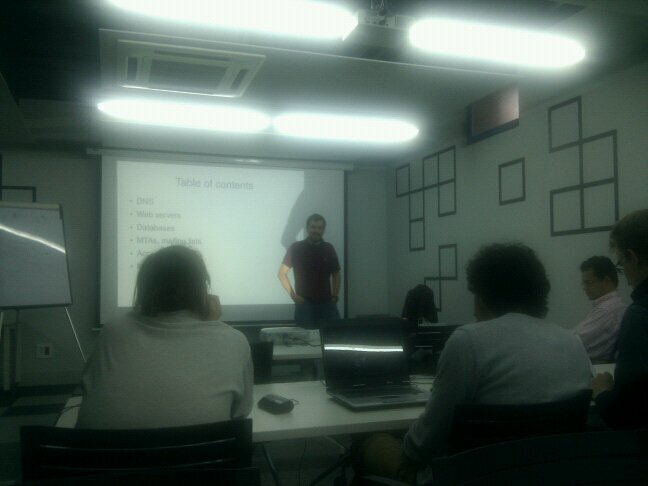 Last Friday I was teaching at the master on libre software we offer in Madrid. It was a fun experience, the students are kind and the place (madrid on rails) is really comfortable. In my first lesson I talked about the importance of logs in the system administration and started talking about the transport layer ( DNS and web servers). We installed a web server (apache) and tried to stress it, of course this was the funniest part. Indeed taking services to the limit is a great way to know them. In the next lesson we will continue talking about services like MTAs, databases, monitoring services, LDAP … I’ll try to transmit the typical problems/challengues that are managed by a system administration during the working week, I’m pretty sure this will be much more useful than repeating a how-to than can be found googling for it.